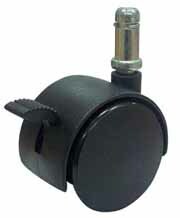 A toe-brake completely locks the caster wheels to prevent the chair from rolling. On a slick floor the chair can still slide if pushed, but it will not roll. In the unlocked position the casters roll easily. It's usually only necessary to lock 2 or 3 wheels to effectively stop a chair from rolling. Available with hard tread for carpeted floors or soft tread for hardwood and tile floors. Stabilizes the chair for fine or precise hand tasks, e.g., artwork, medical procedures, playing a musical instrument. When used for disabled people, a care-giver can lock the wheels when the user gets in and out of the chair; or a teacher can lock the wheels to keep a special-needs student from "scooting around" during instructional periods. Important! Not recommended in situations where the user must navigate around the work area while seated. When you use your legs to scoot around in your chair it's too easy to unintentionally bump the toe-brake with your foot and engage the wheel lock. Make sure the casters you select are made for the type of flooring you have. Hard-wheel casters for carpeted floors. The harder the wheel, the easier it will roll. Soft-wheel casters for hard floors such as tile, wood, or cement. Soft-wheel casters are more resilient to protect the floor and to keep the chair from rolling too freely. Soft casters are also quieter on hard floor surfaces.